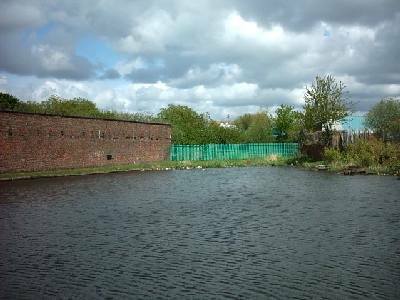 Two new pictures of the old Gorton canal yard added here. May 2005: I have updated some of the information (in red) and added some new pictures - here. 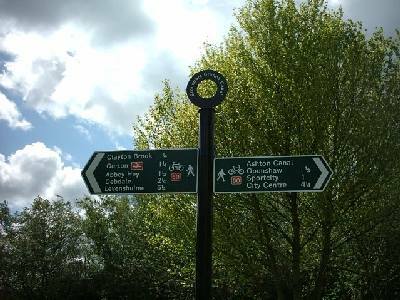 These canal bike rides are like buses, you wait for one then two come along at once! 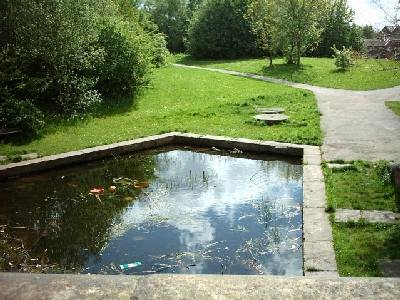 Anyway the weather has been good, so we thought it would be fun to have a look at the old Stockport Branch canal than ran through Gorton and Reddish. 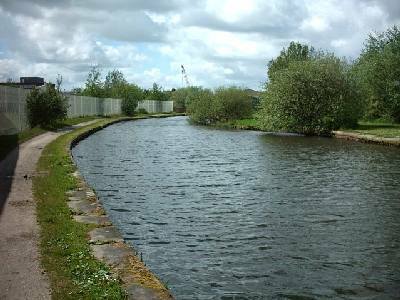 This canal branched off the Manchester to Ashton canal around the Gorton / Openshaw area. 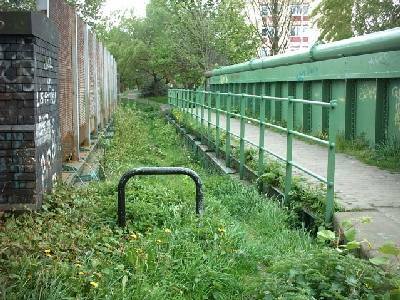 The canal was left in a disused state around the mid 1950s, and eventually it was filled around the 1960s. The canal used to run to the top of Lancashire Hill in Stockport. There is nothing left of the canal in that area, just some of the roads leave some clues. Through Reddish the canal has been built on and re-developed, there isn't much to see, however through Gorton the line has been converted in a path / cycle way.  There is quite a lot of industrial heritage to be seen as well as being a good path to cycle on. This is only version 1 of the page. We hope to get some more pictures of the route very soon. 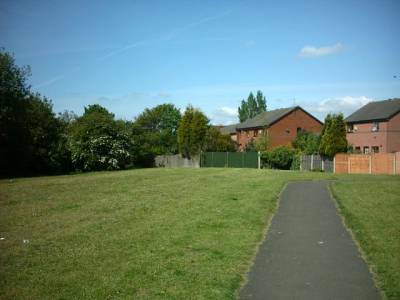 We started at Lumb Lane, Audenshaw, Greater Manchester, this is close to where I live and gives us good access to the Asthon canal. We headed left towards Manchester. The way down to the canal. The canal running through Audenshaw. 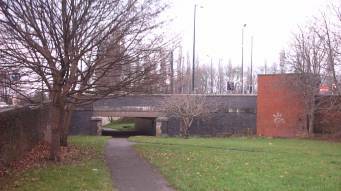 The road bridge ahead carries the A635 Ashton old road. The bridge here has been widened. 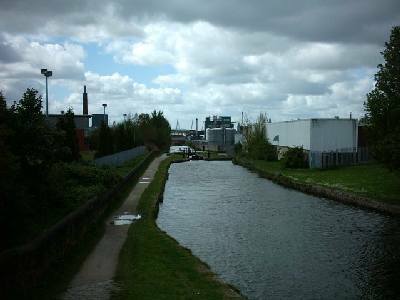 The canal running through Droylsden. Fairfield Road crosses the canal ahead. This is near the town centre at Droylesden. It is know as Fairfield junction. 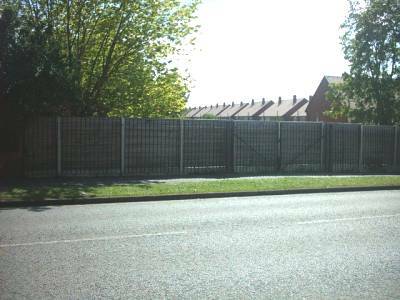 The green fence marks the point where the canal to Park Bridge (Daisy Nook) started. 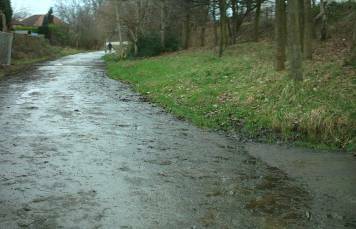 As you can see this canal has been filled in, however past Droylsden the canal is still watered and can be followed right through Daisy Nook. This is a great route to take, one which we will do very soon. 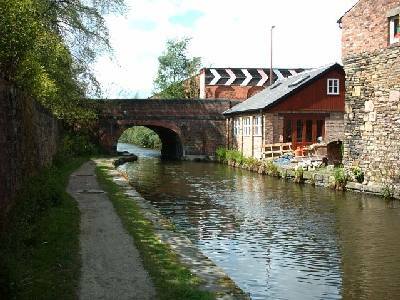 This canal branch is officially known as the Hollinworth branch. This is the view looking towards Manchester. 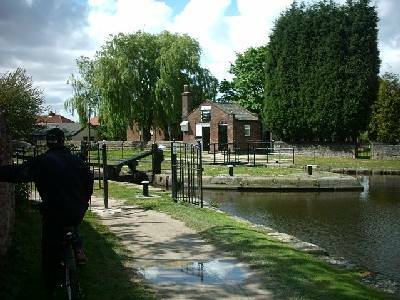 The canal drops down a flight of locks to the left. Notice the old building, probably an old toll booth. The canal curving off towards Manchester. This is around the Fairfield area of Manchester. We are getting closer to the Stockport Branch. The locks running down to Openshaw. You can just see the masts that form the City of Manchester Stadium. The canal goes right past the stadium. The pathway was totally re-ne wed for the Commonwealth games and was promoted as a way to get from the City Centre to the Stadium. We will look at this part of the canal soon. Stockport Branch Junction. This is all that is left of the canal! The Stockport branch looking back at the Ashton canal. 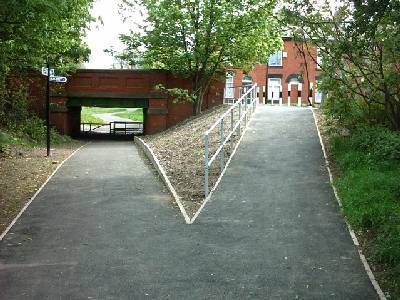 The bridge takes the tow path over the branch. One of the new signs placed along the Stockport Branch pathway. This are the same style as the ones on the Fallowfield Loop. Its 2.5 miles to Debdale Park. Lets carry on! 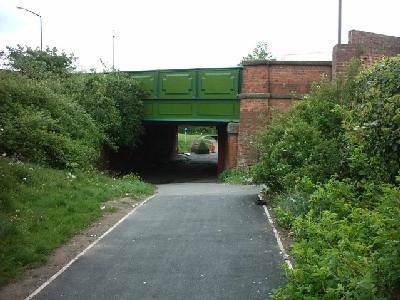 Going back under Ashton old road at Openshaw. Notice the pathway has been renewed. This used to be the entrance to the Gorton canal yard. The bridge over the old junction still exsists. The yard has long since gone and the area today is derelict. The bridge from the other angle (looking towards Stockport). A great piece of industrial architecture which is left on this route. I hope it survives for future generations to see. You can see where the towpath went over the junction to the yard. The aquaduct over the railway near Gorton Station. You can clearly see the original line of the canal. 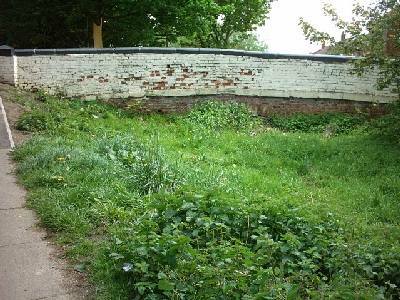 Its now full of weeds and rubbish. This new aquaduct was built in 1905 when they widened the railway to 4 tracks at this point. The railway below runs from Manchester to Glossop and was part of the Woodhead route. There are some great pictures of the viaduct in use and being built in the excellent Woodhead part 1 book by EM Johnson. See the bibliography page for further details. 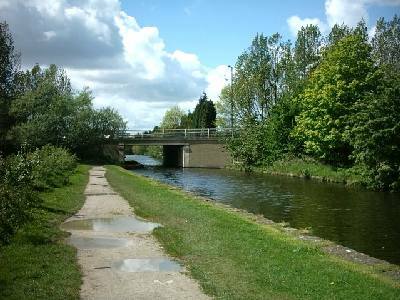 The canal at Abbey Hey. Abbey Hey road crosses at this point. Notice the new access here. 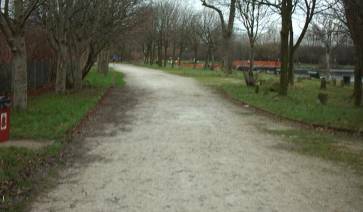 Manchester city council have invested in this pathway and have brought it up to a good standard. Again the path has been resurfaced at this point. 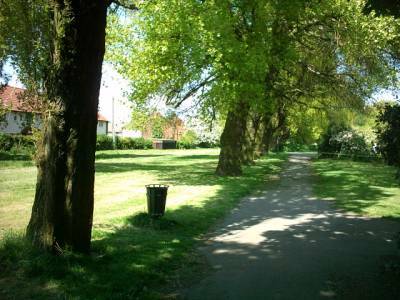 Back of Debdale Park, the orginal bridge took Alston street over the canal. The canal has long been filled in at this point. You can see the old bridge ahead. Great to see this has survived. This was taken on another day (it was raining). 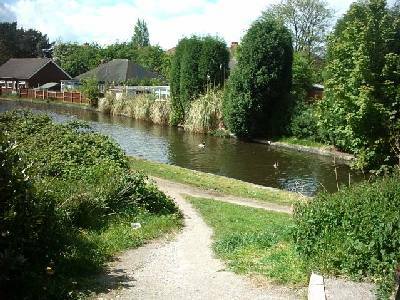 This is the canal route at Debdale park where the Fallowfield Loop starts. You can either start your cycle ride here or use the loop as a way home. 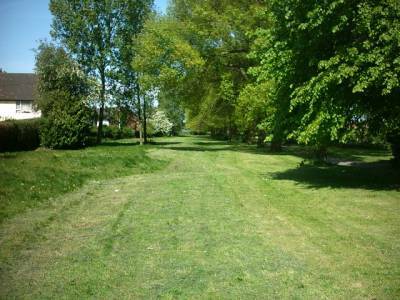 I think its good the local authorities have intrograted these 2 great paths. Its such a shame the Reddish part has long been lost. 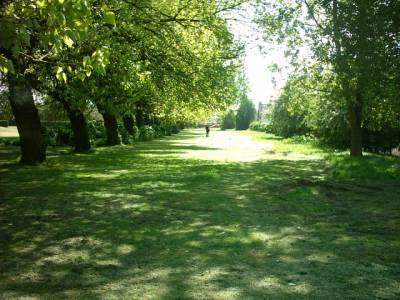 This would have made a great path / cycle way in the Stockport, avoiding the busy roads. 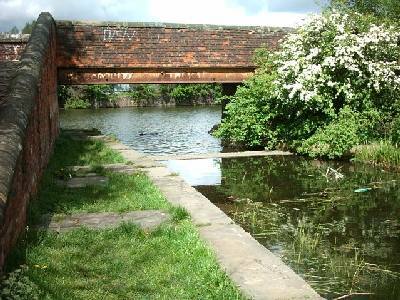 Again an old picture - but this shows the route of the canal under the Fallowfield Loop. 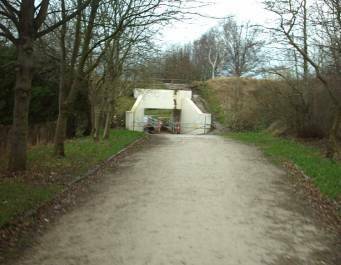 The route of the canal running at the side of the reservoirs at Debdale Park. Again an old picture. Here the canal ran under Hyde road at the Junction of Reddish Lane. The original bridge is still in place (pictured). Behind me the path continues a little in to North Reddish, but from then on the majority of the canal has been lost. At this point you can either loop back or take the Fallowfield Loop. What a shame this route was lost. There is a group looking at getting the route back watered. We hope to add them on to our link page soon. Please pay them a visit. However I'm glad part of the route has survived for future generations. We hope you have enjoyed looking at this route. Its early days with this page, there is a lot more to see and picture. We hope to update the page soon. Latest pictures (15th May) - The line of the canal through North Reddish park. Its hard to believe a canal once ran here. 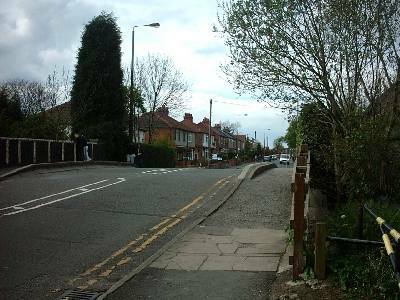 This is the point at Longford road in reddish. The alignmnet ran right through the centre panel of the fence ahead. Only some of the orginal alignment remains, its all been filled in though. The alignment of teh canal looking down back towards Gorton. 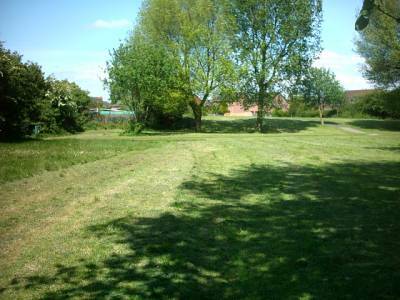 Only the grass and the straight alignment of the trees gives anything away about the location of the canal. Lookig towards Stockport - this clearly shows the straight alignment of the trees. The canal ran straight ahead from this point. The alignment towards Gorton. There may have been locks here as the land rises, but it is hard to say what has been filled in and what is the exact alignment of the canal. A little further on walking back towards Gorton. The alignment ends here and has been built on. The houses are on Shelborne street. There back gardens are built on the old canal. Again there are no signs of the canal here.